(MARANA, AZ) – April 5, 2011 – The PGA TOUR, on behalf of the International Federation of PGA Tours, and Accenture have announced that the World Golf Championships-Accenture Match Play Championship will again be played at The Ritz-Carlton, Dove Mountain in Marana, Ariz., in 2012. The event, which is the first of four World Golf Championships of the season, has been played in the Tucson area since 2007 and at The Ritz-Carlton, Dove Mountain since 2009. The 2012 Accenture Match Play Championship is scheduled for Feb. 20-26. With views of the Jack Nicklaus Signature Golf Course set among towering Saguaros, the initial residential phase will have 110 highly-customized Ritz-Carlton Residences offering a fluid series of indoor and outdoor spaces to be enjoyed year-round. The first phase of The Residences will deliver 72 single-family homes and 38 villas, along with many golf-frontage homesites and 16 exclusive custom estate homesites. Construction of The Residences incorporates high-end residential features such as wood and stone flooring, custom closet fixtures, special wall finishes and the finest appliances, all included in the base price. Request information or call toll free (877) 451-7205. 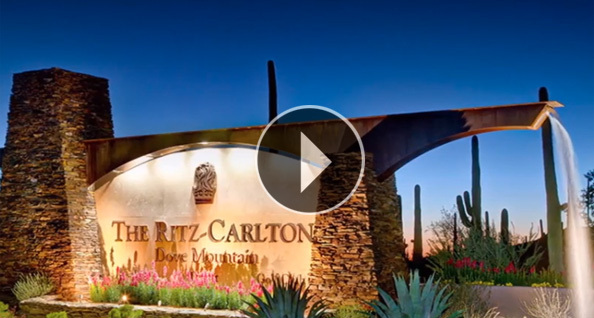 Opened in January 2009, The Ritz-Carlton Golf Club, Dove Mountain is an essential component within the Ritz-Carlton community in Marana’s high Sonoran Desert. Twenty-seven holes of golf and the 45,000 sq. ft. clubhouse complex currently comprise The Ritz-Carlton Golf Club, Dove Mountain, with an additional nine holes of golf proposed in the future. The club’s Jack Nicklaus Signature Golf emphasizes playability and aesthetic appeal while still posing a significant challenge to the world’s best golfers, who are tested by the layout during the World Golf Championships-Accenture Match Play Championships each February.